Your pool is an important part of your outdoor area and it’s time to take care of it. 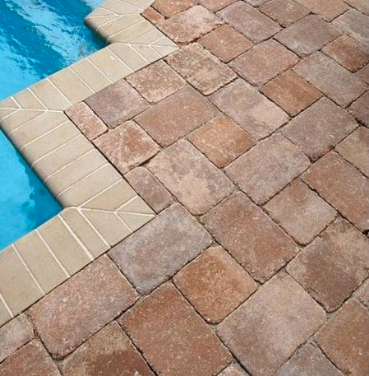 Why not remodel your pool deck and create a brand new surface that will be both inviting and convenient? Our pool deck service is here to help you to build the elegant finish that your pool deserves. Turn your backyard into the perfect urban oasis where you and your loved ones will enjoy relaxing moments together. If you finally decided to hire someone for a total pool makeover but you don’t know where to start, our company is where you should look for inspiration. 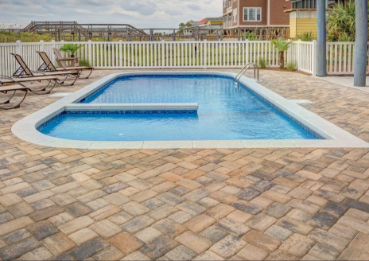 We have rebuilt entire pool decks with pavers numerous times, and the response from our customers have been overwhelming. Referrals are how we get most of our business and there is a reason to this: most people are tired of seeing the same pool decks over and over, and they want something new and fresh that will give their poolside area something unique. Pavers will give a timeless look to your landscape and can be easily replaced and maintained compared to other materials. We can even build you a matching patio if you want to extend the entertainment area for a complete makeover. Time to get rid of that old-school pool deck from the 90’s and replace it with something better. You should also note though, pavers can still become very hot under the sun just like concrete or other similar materials. But contrarily to what some people think, heat is not only about the color but also about the specific material used. Unsurprisingly, black or dark natural stones will get a lot hotter than lighter options like tile. We have created a dedicated service for your pool decks because we know how important this part of your backyard is. This where you hang out with your friends to share a drink, where you like to lounge after work or during the weekends, and where you spend most of your time outdoors when you’re in your garden. Apart from remodeling, we also handle new construction projects of all kinds. We are located in the beautiful city of Melbourne and also serve the surrounding communities. A team of seasoned contractors is working with us to deliver the best professional results possible. We want you to literally be wowed when you see the final result. Complete satisfaction on your side is our goal and we will gladly go the extra mile to get to that point. Building a pool deck requires precision and expertise and this is exactly what our team members offer. There are plenty of patterns, colors, and styles to choose from. Just tell us what you have in mind and we will do our best to turn it into a reality. Call today at 321-280-9011 to get a free estimate. Our pool deck experts can come take a look in person if desired, in order to give a more precise idea of what to expect in terms of results and rates.